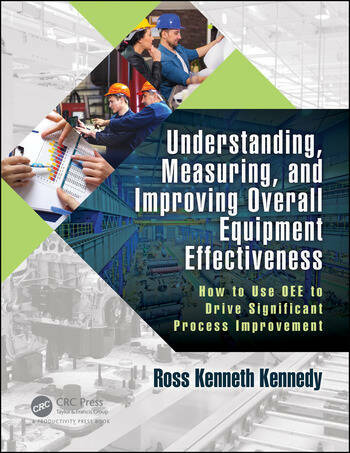 Understanding, Measuring, and Improving Overall Equipment Effectiveness: How to Use OEE to Drive Significant Process Improvement explains why the Overall Equipment Effectiveness (OEE) measure was created and how it should be used. Based on 20 years of hands on experience applying OEE at over 150 sites, this step-by-step practical guide provides templates, assessments, a comprehensive loss-analysis framework to identify all possible variables that could affect OEE, and supporting spreadsheets to measure and improve OEE. It outlines the different operational situations in which OEE can foster improvements, and the implications, before providing an easy-to-understand template for creating appropriate definitions for all the losses and a loss model. The author explains how to calculate OEE using examples to improve performance, and then shows, in detail, how to use an OEE Loss Analysis Spreadsheet to understand all losses, set an ideal vision, and then classify losses so improvement can be approached in the most sustaining way. Introduction. Chapter 1: Understanding Overall Equipment Effectiveness (OEE). Chapter 2: Measuring OEE. Chapter 3: Calculating OEE. Chapter 4: Improving OEE. Chapter 5: Using the OEE Loss Analysis Spreadsheets. Chapter 6: Automating OEE Data Capture. Appendix 1: OEE Improvement Rating. Appendix 2: OEE Improvement Mind Map. Ross commenced his working career in 1970 at the Port Kembla Steelworks (12 yrs); followed by Cable Makers Australia (5 yrs) and David Brown Gear Industries (3 yrs). Over these 20 years he gained hands-on manufacturing and operational experience covering maintenance (14 years), production, operations and executive roles before moving into management consulting. In 1985 Ross developed his passion for Lean Production following his involvement in the Value Added Management (JIT) initiative by the NSW Government. Ross quickly and effectively applied the new Lean principles and practices firstly at the CMA Foam Group Lullaby Bedding Factory while Factory Manager, then CMA’s Cable Accessories Factory as Site Manager before moving to David Brown Gear Industries as Manufacturing Manger to establish and oversee the relocation of the company from Sydney to Wollongong to a new facility set up on Lean principles and practices. In 1989 after the new facility was well established and recognised for its leading edge improvements based on Lean, Ross was invited to join the new JIT / Lean practice being established by the Manufacturing and Operations Group of Coopers & Lybrand's International Management Consulting Practice based in Sydney. Over the next 5 years Ross had the opportunity to work on major assignments with some of the firm’s leading Lean practitioners from USA, Canada and the UK. It was also during this time that he first came across TPM (a critical missing link in the Lean tool kit) in 1990 when he led one of the first implementations of TPM in Australasia under the guidance of John Campbell who was Partner-in-Charge of Coopers & Lybrand’s Global Centre for Maintenance Excellence based in Canada and author of the internationally recognised maintenance book – Uptime. In August 1994 Ross established his own consulting practice specialising in TPM. He organised and chaired Australasia’s first TPM conference in 1995 and, at the request of the delegates at the conference, Ross with several colleagues founded The Centre for TPM (Australasia) in January 1996 to provide a membership-based organisation to support Australasian industry and academia. After extensive research including a trip to Paris in 1997 to attend Europe’s first World-Class Manufacturing & JIPM-TPM Conference and associated workshops with leading TPM practitioners from throughout the world, The Centre for TPM (Australasia) launched its TPM3 methodology in January 1998, which is an enhanced and expanded Australasian version of the Japan Institute of Plant Maintenance (JIPM) 3rd Generation TPM embracing the Toyota Production System and spanning the entire Supply Chain. Since then CTPM has been involved with a wide range of leading manufacturing, mining, processing, utilities and service companies. For example from Sept 1998 to June 2003 CTPM assisted Telstra roll-out their TPM initiative to over 200 teams servicing their Customer Access Copper Network in 16 Regions throughout Australia resulting in over $110m in savings. Ross has been actively involved with Lean Production since 1985, TPM since 1990 and Australasian TPM & Lean (TPM3) since 1998 and has delivered publicly over 200 workshops and papers on the subjects both within Australia and overseas. CTPM, under the direction of Ross with his team of experienced CI Specialists, is presently assisting over 30 sites located in Australia, New Zealand, Thailand, Indonesia and China on their TPM & Lean / CI journeys to Operational Excellence and World Class Performance.